A major law change is effecting out Flathead catches. 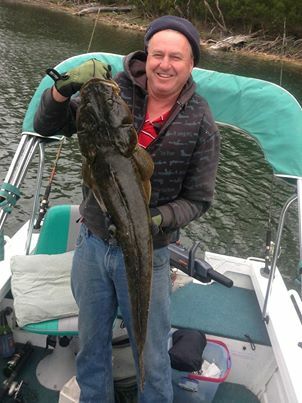 Monster Flathead are being caught more often. So how do we care for these magnificent fish? Here are some suggestions for the conscientious and caring angler to think about. Your comments and feedback on this latest issue are welcome. If we can further refine this page, that would be much appreciated. Here is the DEPI advice on handling caught fish. Reckon you know your fish? How much water in the lake? Grab a Bacon and Egg Roll with a Cappa' from the Cafe before you head out. Fantastic value and great taste. Lake Tyers Beach Cafe. Just delicious! How to treat a Monster!! Caring for the large Flathead that are to be returned to the water. 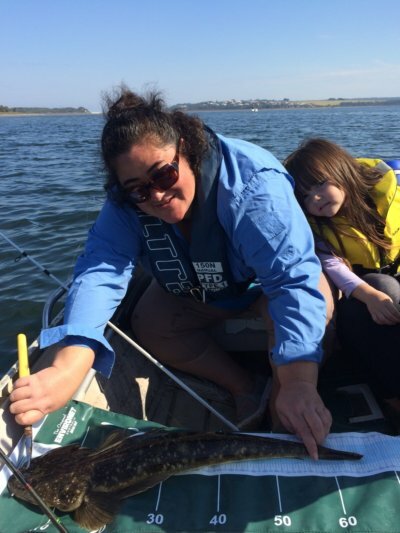 A reader of the website Alan Lucas has made a good point about handling the monster Flathead that are more frequently being caught at Lake Tyers (and probably everywhere else thanks to the max size limit of 55cm, ie they must be returned to the water). These are great trophy fish and worthy of special attention. Most people will realise that the fish must not dry out, should have line cut and deep set hooks left to rust out and not have the mouth/jaw damaged with metal holders. Alan has made an extra point that holding these fish out of the water with a "fish holder" by the jaw will be putting a large strain on the muscles and nerves along the vertebrae, and the pads in between. While the code says all large Flathead must be returned, it does not necessarily mean the returned fish will survive if they are not treated carefully. While a fish is in the water it weighs less because of the bouyancy of the water, and the fish is horizontal. When the fish is landed the full downwards weight is realised. The fish will be blissfully unaware of its own weight until you have landed it. If a photo of the Flathead being held by the proud angler is required then make sure most of the weight of the dangling fish body is supported by your hand. Remember all the weight of the lower part of the Flathead hangs off the first vertebrae behind the head, and only gradually grows less and less as we move along the spine. So some solid support for the body is a good idea. To left is a picture of Hans Orth with a 95cm Monster, supporting the big fish a midships, and also not using pliers or fish holder, but heavy gloves to hang onto the jaw of the fish. Holding the fish sideways and more horizontal could also have helped. Dangling is not good! it is their own body weight that breaks their neck. So don't let this happen to our magnificent Flathead.